Lawrenceville Family Dental Care serves the residents of Lawrenceville with root canals as well as comprehensive dental care. We are a family dental practice serving children and adults in Lawrenceville and the surrounding areas. Our practice includes an experienced root canals dentist as well as a dedicated team of dental support professionals. Our dentist and staff are highly trained and experienced in restorative dentistry and are committed to restoring and enhancing the natural beauty of your smile using conservative, state-of-the-art dental procedures that result in beautiful, long-lasting smiles. Root Canals Offers Pain Relief for Infected Teeth! For root canals dentist you can trust in Buford, call Lawrenceville Family Dental Care. Our dentist is highly trained and highly experienced in performing painless root canal procedures. If you have a tooth that is infected, you may be in need of a root canal. The procedure involves removing the infected nerve and pulp from the center of the tooth and then cleaning and sealing the area. Root canal procedures do not have to be painful, however, infected teeth are very painful. Failure to receive a needed root canal procedure can lead to serious, painful and expensive dental problems such as abscesses. If you suspect one or more of your teeth may be infected, schedule an appointment with one of talented dentist at Lawrenceville Family Dental Care today. 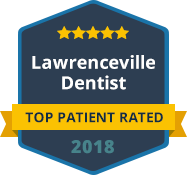 Lawrenceville Family Dental Care provides painless root canals as well as a full range of general, restorative and cosmetic dental care for the residents of Lawrenceville and the surrounding areas. If you or a member of your family is in need of dental care, please contact our office today to schedule an appointment. Our office accepts most forms of dental insurance and we also welcome patients who are not covered under a dental insurance plan. We look forward to restoring the form and function of your smile.